Suspect in attempted hit-and-run in Samaria flees the scene; second attempted attack on soldiers in 24 hours. A Palestinian Arab man attempted to run over IDF soldiers near Homesh in northern Samaria Wednesday, before fleeing the scene of the crime. 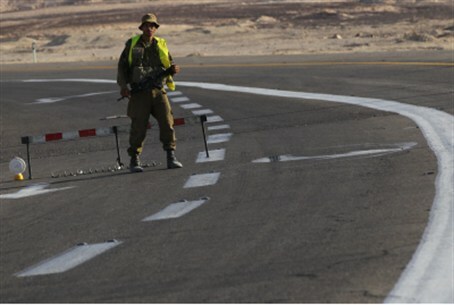 The incident unfolded when IDF forces identified five suspicious vehicles in the area and pulled the motorcade to the side of the road for questioning. One of the drivers, a Palestinian Arab man, attempted to attack one of the soldiers and run him over; warning shots were fired and the driver fled the scene. The soldier was not hurt. The attempt is the second in 24 hours targeting IDF soldiers. Earlier Wednesday, 19 year-old Mohammad Mubarak opened fire on an IDF guard post next to the Samaria community of Ateret, which lies roughly midway between Jerusalem and Shechem (Nablus). Soldiers returned fire, killing the terrorist. Both attacks erupted just 24 hours after the Israeli Security Agency (ISA or Shin Bet) released statistics once again noting that terror attacks have been on the rise in Judea and Samaria. The attacks have been linked directly to the US-brokered peace talks between Israel and the Palestinian Authority (PA), alongside the PA's ongoing incitement campaign against Israel. Prime Minister Binyamin Netanyahu reiterated the need for the incitement campaign to stop in light of talks Tuesday, during a press conference with visiting Prime Minister of Georgia, Irakli Garibashvili. According to Netanyahu, the PA has been using inflammatory statements against Jews and Israel as a "way of poisoning the atmosphere for peace."